The bestie called the other night. Her: "What are you doing?" Her: "What are you making? Bean sprouts...with...girdle turdle...and..poo?" I'm not sure what girdle turdle is, but we have a way of making up words to entertain ourselves. This conversation however, is the perfect example of how many of my friends perceive the way that I eat. I've noted before that I only purchase organic or locally grown food--but I'm not so hard-nosed that I won't get my fix of Asian food-products, or will refuse to dine out. Here is a dish that can be whipped up for dinner in a matter of minutes--and it's full of good-for-you things. A few of you have asked me for ways to prepare quinoa, and this is one way I commonly use it. Of course everything can be varied to your tastes. Cook quinoa similar to rice--two cups of liquid (chicken broth) to one cup quinoa. I like to cover the pot, wait until it boils, and then quickly turn it to simmer for 15 minutes. Uncover after 15 minutes, and fluff the quinoa--the germ will separate from the kernal, and will have a slight bite. Lightly season your chicken with salt and pepper, and then pan-fry until golden on each side. In a large bowl, whisk the olive oil, vinegar and cumin. 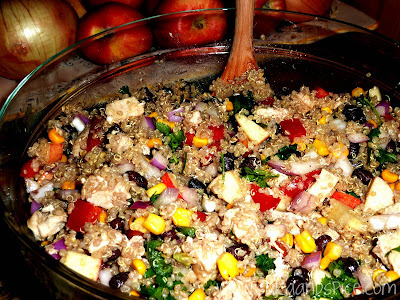 Prepare apple, red onion, red pepper, corn, and jalapeno--toss them in the bowl with the dressing. Next add the chicken, quinoa and black beans. Last, (carefully) add avocado and cilantro. I love quinoa so I may try this. I love the addition ont he apple! Great idea to enhance the flavours!!! It looks really delicious. I love everything that has quinoa in it. It is healthy and it's a filling dish. I'll try it too. Thanks for sharing! I will have to try this! Sans the chicken....as I am vegetarian. I'm curious to hear about more of your other recipes, as they are probably veg friendly! Love how colourful that dish is! YUMMY! I could eat variations of this for a long time. Not all good food is photogenic (i.e. curries). That looks so good omg..
en dessous tu dis moi se trouvait à.